Holy Toledo. Sorry Ohio, this is not my favourite city. Day one of our nine-day five State Red Roof road trip with my dog Victor and I’ve booked our first stop at Red Roof Inn Toledo – mid-way between home and Lexington, Kentucky. The hotel is nice enough and staff friendly. It’s minutes from the highway, rows of strip malls, stores, gas stations and food sources including Sonics Drive-In, which I tried for the first time because I can eat parked in the car with my schnauzer/poodle cross who’s proving to be an easy-going road trip companion. Like most pooches, Victor needs to run, often and fast. So parks and trails are what we need. Toledo’s Metropark system doesn’t disappoint. Swan Creek Preserve at 4301 Airport Highway, about 10 minutes from the hotel, is exactly what the exercise doctor ordered. Intended to be a wilderness oasis in the middle of a city that could use an oasis, it’s big enough to be home to red foxes, white-tailed deer, quail (we saw a female with chicks), muskrats, weasels, and even screech owls active at dusk – when the 588 acres of woods, meadows and flood plains, closes. Opened in 1973, Swan Creek Preserve is a quiet escape with wide gravel paths (some paved) and narrow hiking trails through the forest. Most people stick to the gravel path. Individuals break from work for exercise, young boys ride bikes, and teenage guys walk and talk on phones – a diverse group uses this park. Today, likely because it’s Tuesday afternoon, we’re the only dog team here, which is unusual on a trail. Leashes are technically required though it is so quiet and hot, Victor needs some freedom. Much to my elation, he heads with confidence over the suspension/swing bridge extending across a deep creek. Much to my de-elation, he dekes left at the end and heads straight into the water for a full-body swim, soaking his harness, collar and jaunty bow tie he sports to win admirers (and forgiveness). Victor rarely swims. But today it’s that hot and we’ve been in a car that long. Good thing we’ll be on the trails for a while. This is a well designed, maintained and marked park, easy to navigate by following the signs directing you to any of the colour-coded trails. There’s even a look out point over the creek. Garbage pails dot each path intersection so disposing of poop bags is easy. We follow the orange one called Meadow Trail that intersects with the red Swan Creek Trail. The Brown Trail is a fitness route around the park designed for joggers and bikes. The Blue Trail is furthest away in the Northern loop for those determined to spend the day hiking. We circle back to the suspension bridge within an hour or so. Victor wades back into the water. Great. I’m hoping Red Roof doesn’t mind wet dog smell. 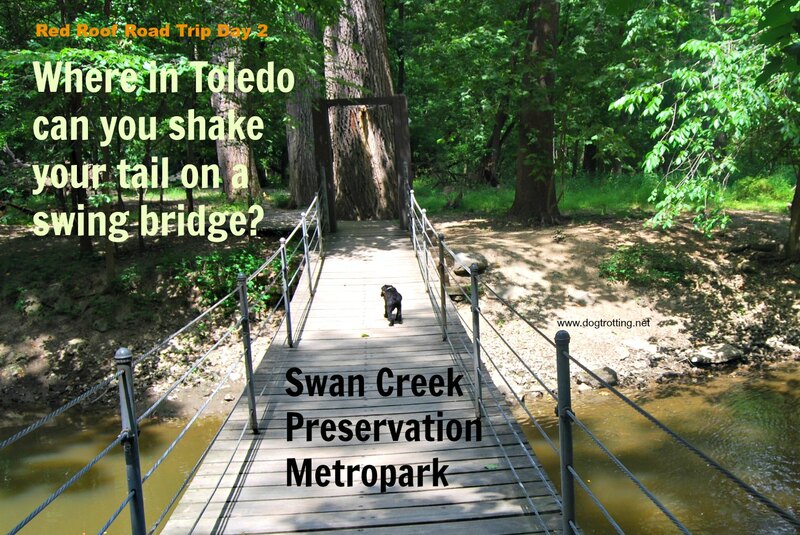 TRAVEL GUIDE: Swan Creek Preserve is one of several MetroParks located in Ohio’s Lucas County that’s within the Maumee River Watershed, the largest of the Great Lakes Basins. The other MetroPark located in Toledo is the most popular: Wildwood Preserve, 5100 West Central Avenue. It’s a 493-acre park and former estate of Toledo’s Stranahan family complete with historic home. For more hikes, check out this guide to the state’s best hikes on Amazon. Next stop: The Kentucky Horse Park in Lexington, Kentucky. Know of anywhere else in Toledo that’s dog-friendly? Let us know in the comments below.